Jesperi Kotkaniemi: Ready for Prime Time - The Point Data-driven hockey storytelling that gets right to the point. There were two main things I took away from last night’s game in Montreal when I left the Bell Centre: The Leafs powerplay looks scary good and Jesperi Kotkaniemi can hang with the big boys. The Canadiens 3rd overall pick went toe-to-toe with two of the best centers in the game, Auston Matthews and John Tavares, and didn’t look out of place at all. 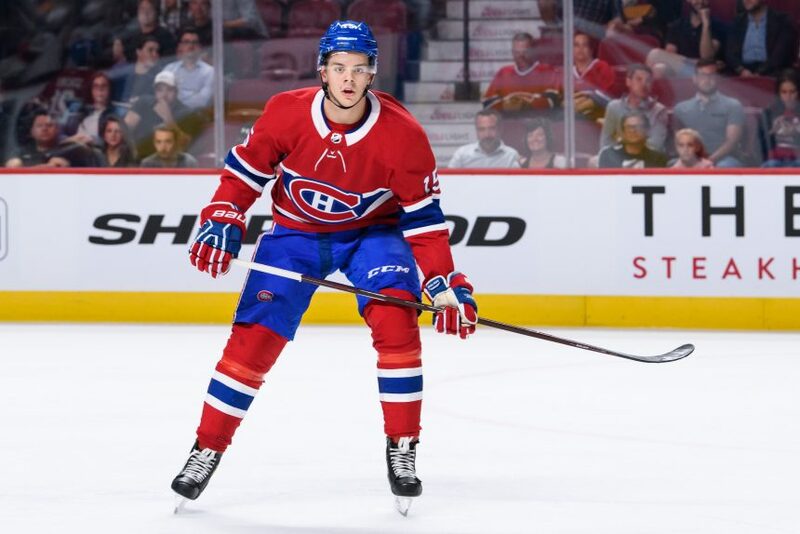 Canadiens coach Claude Julien stopped short of saying it but I will – the Canadiens outplayed Toronto at even-strength last night and Kotkaniemi was one reason why. In 8:41 even-strength minutes against Matthews and Tavares, the Canadiens out attempted the Leafs from the slot 6-1 with Kotkaniemi on the ice and outscored them 1-0. While that provides a snapshot into the effect Kotkaniemi had while on the ice, it doesn’t tell the full story as to his individual impact on the game. His poise and vision with the puck was noticeable throughout the game – look no further than his assist on Brendan Gallagher’s 2nd period goal. Kotkaniemi finished the game with 19 completed passes at even-strength, more than any forward in the game. As nice as the feed to Mete was, which set up Gallagher’s goal, subtle plays like this one in the neutral zone, which led to a controlled zone entry and a shot at the net, show a high level of skill and confidence. Kotkaniemi’s ability to distribute the puck in transition and set teammates up in the attacking end showed in his impressive passing metrics. Those “good things” include his awareness away from the puck. Kotkaniemi recovered 16 loose pucks at even-strength, the most of any Canadiens forward. Even the best players in the game don’t have the puck on their stick 90% of the time they’re on the ice so what you do away from it is incredibly important and is often the steepest learning curve for young players. Not the case last night for Kotkaniemi. 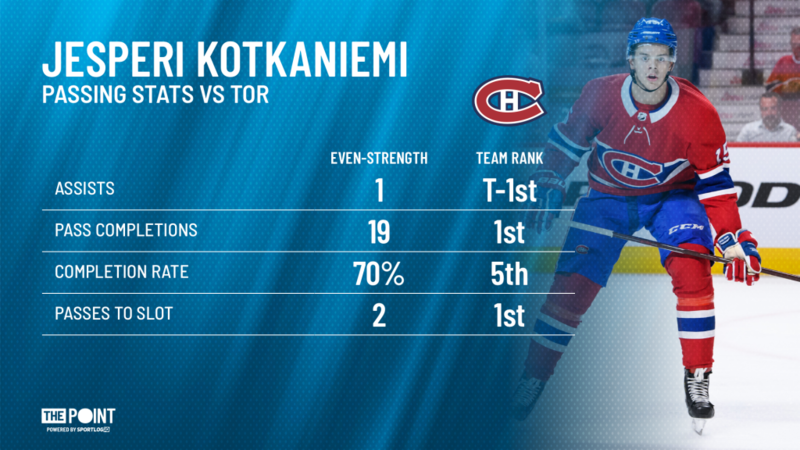 There has been a clear and impressive progression in Kotkaniemi’s game from his first rookie game in Laval to what we saw last night against the Maple Leafs. In his first big test against elite center competition, Kotkaniemi passed with flying colours.